This was a challenging cruise that should satisfy anyone looking for a serious, heavy weather experience offshore. The first four days were very cold, even after we crossed the Gulf Stream, due to a strong Alberta Clipper (cold front) that roared over us and churned out waves to 25 feet. But then we reached the Trade Winds, turned dead south and did a little roaring ourselves down I-65 to St Thomas. 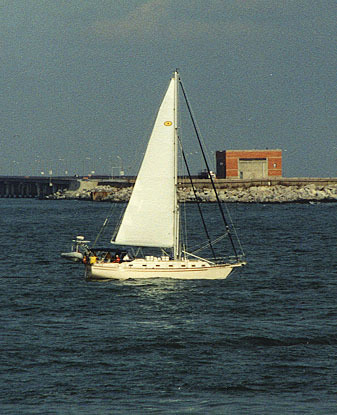 We began in Rock Hall, MD our homeport on November 11 when I was joined aboard HALIMEDA by Dennis Sweeney and my son, Pete Tursi for the delivery trip down Chesapeake Bay to Norfolk, VA. After final loading and organizing of equipment, we departed Rock Hall at 10 am on November 12th and headed south. The weather was cool and brisk with lots of geese flying here and there... a typical Fall day on Chesapeake Bay. We arrived at Solomons Island on the Patuxent River just as the Sun dipped below the horizon leaving a friendly red sky in its wake, set our anchor near Ship Point, cooked up some Dinty Moore for dinner and turned in early. Next morning we got underway shortly after sunrise and, after a 14 hour run down the bay, arrived at Little Creek Harbor in Norfolk about 8:00 pm on November 13th. The US Navy's Atlantic Amphibious Fleet makes its home here, so Little Creek Harbor is well marked and makes a fine all-weather port. 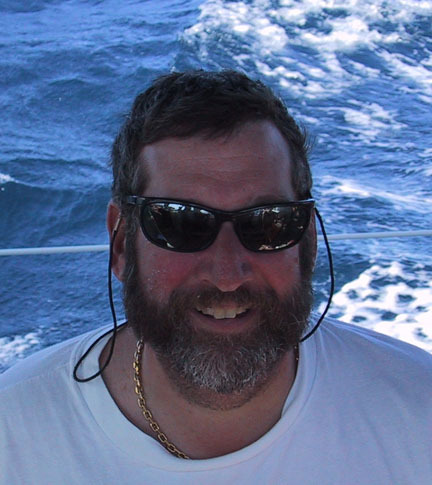 Lew Jalbert, one of our sailing instructors serving as First Mate on this cruise arrived on November 14th. Peter Schloss and Dr. Greg Beckner arrived November 15th, and, due to some last minute schedule changes, Jim Bortnem arrived November 17th. 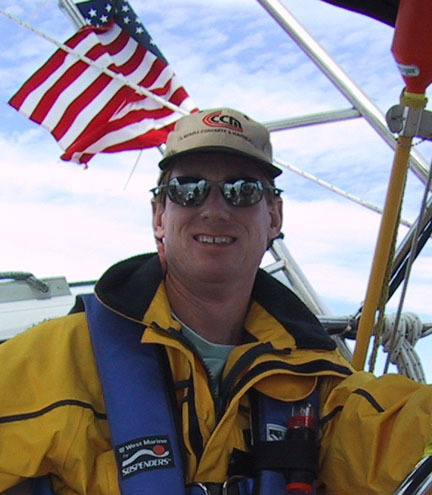 Jim has sailed with us on several previous cruises, once as First Mate, so his late arrival was not a problem for our pre-departure training. 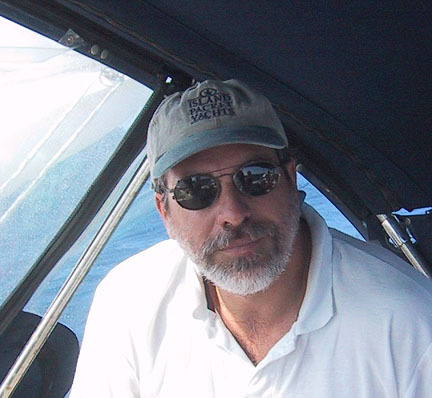 Pete Tursi departed for home after enjoying the brief trip down the bay. After interviewing all crewmembers and reviewing resumes, I made the following assignments for pre-departure inspections and training: Peter Schloss as Engineer responsible for all machinery, electrical and electronic systems and damage control equipment. Greg Beckner and Dennis Sweeney as Boatswains responsible for all deck equipment, sails, spars and rigging. 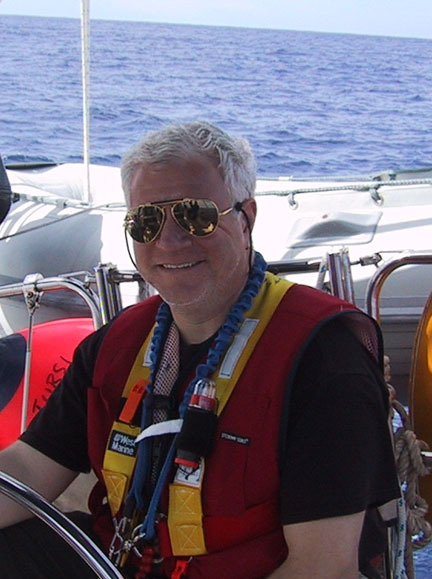 Jim Bortnem as Emergency Coordinator responsible for abandon ship and man overboard equipment, procedures and training. Lew Jalbert as First Mate worked with the Bosn's and I worked with the Engineer and Emergency Coordinator plus performed the Navigator preparatory duties. On November 16 and 17 we conducted extensive pre-departure training sessions with all crewmembers; we thoroughly inspected the entire yacht from stem to stern and to the masthead (I had previously inspected the underwater condition during a recent haulout) including belowdecks; we went over every piece of equipment, all tools and spare parts; all procedures, both routine and emergency. 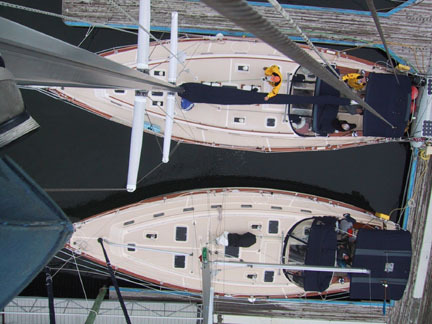 We rigged the storm trisail, boom crutch, sea anchor, whisker pole, cruising chute, mainsail, genoa and staysail. We did a complete walkthrough of abandon ship and man overboard procedures. And, by the end of the second day, found that we thoroughly knew the boat, equipment, procedures and, importantly, each other. 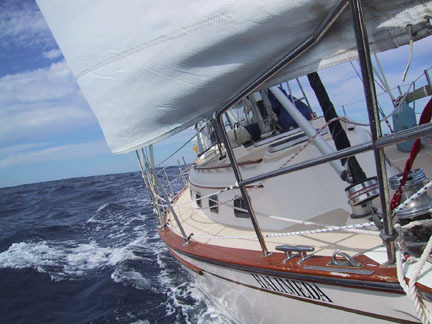 We'll be joined in this cruise with two of our other yachts: HOT WATER, an Island Packet 420 skippered by Captain Rose Witte, will sail from Norfolk to St Thomas with a crew of six on a similar training cruise as ours. 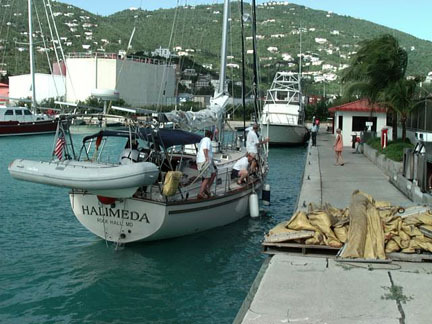 SITOA, an Island Packet 35 crewed by Captain Curt Chapman and his wife Eva Chapman will sail from Florida to St Thomas where they conduct sailing classes for our program. We agreed to speak daily over SSB radio during the cruise to keep a check on each other and swap recipes and sea stories. Of course, we're separated most of the time by hundreds of miles, but periodic communication as this is helpful in analyzing weather trends and increases safety in the event of unforeseen problems. Weather systems at this time of year are dominated by fast moving cold fronts from the north which pack winds to 50 knots and spawn intense low pressure systems as they come in contact with southern warm air masses. These have the ability to generate hurricane force winds and can be particularly problematic if encountered in the Gulf Stream with its strong, north setting current. Generally, at this time of year, windows of relative calm lasting one to two days exist between these fronts. Conventional wisdom is to get across the Gulf Stream during one of these windows before the next front comes through, otherwise one may encounter strong winds opposing strong currents, a certain recipe for large breaking waves and an uncomfortable ride. Weather forecasts showed a calm window for our scheduled Saturday, November 18th departure, but indicated a Low Pressure System off the southern Atlantic Coast which was expected to travel northeast and pass Cape Hatteras late Sunday. The west wall of the Gulf Stream is about 100 miles from Norfolk where it passes Cape Hatteras and the stream is about 50 miles wide at this point. So, it appeared that we had just enough time to reach and cross the Gulf Stream before severe weather settled in. Thus, we departed Norfolk on Saturday morning, Nov 18 and sailed our rhumb line of 138 degrees True based on a target point of 26N/64.5W where we would turn due south. Progress was good with winds SW at 15 knots. At dawn on Sunday with the Low approaching, winds veered to NW at 20 knots, then to NE at 20 by noon and ENE at 30 knots by evening, but by this time we were through the Gulf Stream. The barometer dropped from 1031 to 1012 mb during the evening as the Low approached. 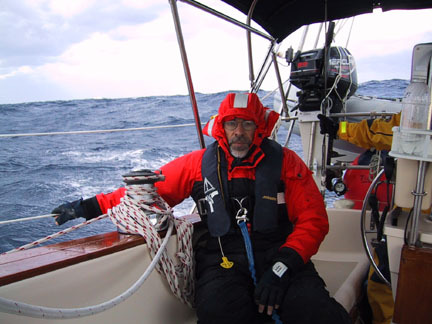 Then during the night winds averaged 35 to 40 with gusts to 50 knots and cold, driving rain and limited visibility. Seas were 3 to 6 feet and HALIMEDA rode comfortably although the triple reefed main sail took quite a beating with damage to several sail slide fastenings. By dawn on Monday, the barometer rose to 1020 mb and winds dropped to a very comfortable N at 15 knots. 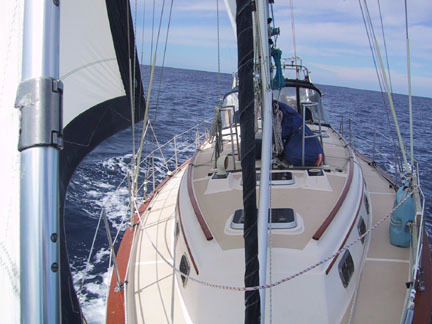 We surveyed the mainsail damage and decided to heave to for repairs which took about eight hours to complete during which time the winds backed to SW at 15 knots. We found only one minor rip in the sail itself near the luff rope, two plastic sail slides broken and three sail slide webbings torn. This was all repairable with onboard skills and spare parts and served as a good learning experience for our crew. This Low was dragging a Trailing Cold Front and our current weather forecast predicts Gale conditions with NW winds to 35 knots and seas of 8 to 15 feet. Since we had about 1200 miles to go, we decided to put up the trisail and save the mainsail from further damage. 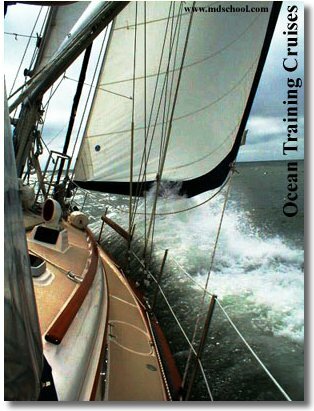 This we did and took the opportunity to practice heaving to in heavy winds and mounting seas. Temperatures were very cold as the front passed and everyone was bundled up to the maximum. 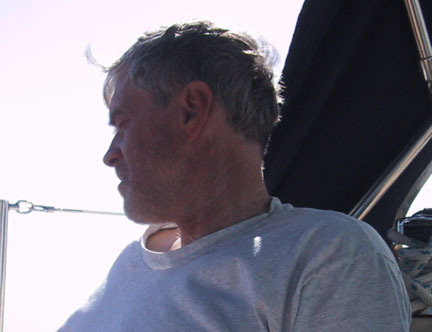 After a few hours, we reached off with trisail and staysail on our rhumb line course of 138 degrees True in NW winds of 30 to 35 knots and seas of 20 feet. Several of these waves decided to break into the cockpit with little serious consequence since we had the main hatch and lazarettes secured and locked. We rode comfortably for the next few days as winds fluctuated up and down and air temperatures gradually rose to more pleasant levels. Before long, everyone was in shorts and T-shirts and life became bearable again with lots of high spirited sea stories and gourmet meals. By Thursday evening, 11/23 winds became light and variable and then went to E at 10 knots and gradually increased to E at 25 knots by the next day. We were sailing on port tack and had to remain close hauled to make our rhumb line and were concerned that a further veering of the wind would prevent making our target point. 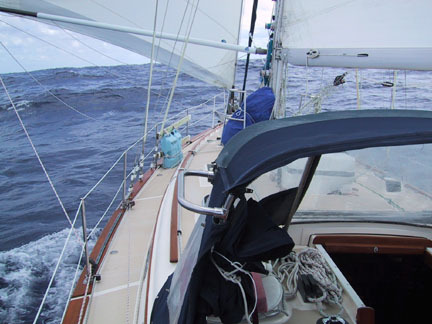 So, at 1700 on 11/23 we tacked over to starboard and sailed close hauled with full genoa and reefed main. Then, as the wind did in fact veer further we were able to make additional easting toward our target point. At 1500 on 11/25 we reached our target Longitude of 64.5W and turned due south. For the next few days the winds remained E to SE at 15 to 25 knots and we had a great, rollicking sail heading straight south in warming conditions. As we listened to the weather forecasts out of the Coast Guard station in Portsmouth, VA speaking of low pressure systems, trailing cold fronts, gale force winds and cold temperatures, we could only smile smugly that all of that was left behind and that we were now in the tropics! All we had to contend with were persistent easterly Trade Winds and an occasional rain squall as we charged south to St Thomas. At 0600 on Wednesday, 11/29 we sighted the island of Jost van Dyke in the BVI and shortly afterward noted depth recording on our instruments. We were on soundings and near our destination! We had been able to maintain our easting to this point and could now ease sheets and sail SW toward the passage between Tobago and the west end of Jost van Dyke. 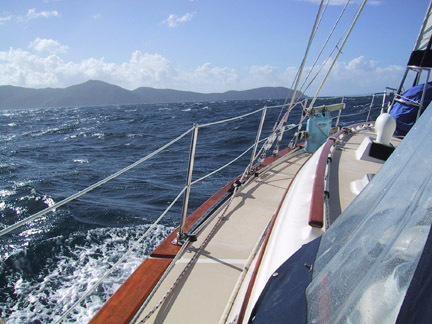 From here, we turned south toward the Windward Passage between St. John Island and Lovango Cay, then southwest past Rata and Steven Cays to our portside, turned south again and left Dog Island to starboard and turned west along the south side of St Thomas leaving Buck Island to port and Hassell and Water islands to starboard. Then we turned north to Gregerie Channel and entered Crown Bay Marina at 1300 on 11/29, eleven days and 1400 sea miles since leaving Norfolk. It was a great trip, but all were glad to be back shoreside again.